After completing his studies at Cambridge and taking (1633) holy orders, Taylor was nominated by Archbishop Laud in 1635 to a fellowship at All Souls College, Oxford. He became chaplain to Laud and rector of Uppingham, Rutlandshire in 1638, but as a chaplain-in-ordinary to Charles I, Taylor left his country church in 1642 to serve the king at the outbreak of the civil war. After a royalist defeat in 1645 before Cardigan Castle, in Wales, he was briefly imprisoned. 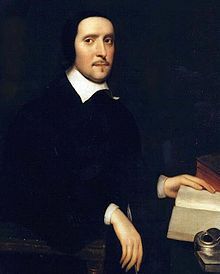 In 1645 he became principal of a school in Caermarthenshire, Wales, and served as private chaplain to the 2d earl of Carbery, at whose home, Golden Grove, Taylor wrote some of his most distinguished works. His period of greatest literary production was between 1646 and 1660. The Liberty of Prophesying (1647) was a noteworthy call for toleration. His Great Exemplar?…?the Life and Death of Jesus Christ (1649) was followed by other books of devotion:Holy Living (1650), Holy Dying (1651), The Golden Grove (1655), and The Worthy Communicant (1660). His learned Ductor Dubitantium or, The Rule of Conscience (1660) was dedicated to Charles II. After the Restoration, in 1660, he was given the bishopric of Down and Connor, in Ireland, and appointed vice-chancellor of Trinity College, Dublin. At Dromore, which was added to his see, Taylor built the church in which he is buried. His tenure from 1660 to 1667 as bishop was a period of turbulent dispute with the Presbyterian ministers who refused to acknowledge episcopal jurisdiction. Taylor has been called the Shakespeare and the Spenser of the pulpit. A number of his sermons were published; many critics consider that in them his mastery of fine metaphor and his poetic imagination are best revealed. Taylor's Whole Works (ed. with an admirable biography by Reginald Heber, 15 vol., 1822) was edited and revised by C. P. Eden (10 vol., 1847-52). The Golden Grove, with selected passages from Taylor's sermons and writings, was edited in 1930 by Logan Pearsall Smith and contains a bibliography of Taylor's works by Robert Gathorne-Hardy. This book is the second volume in a two-volume devotional set. While this volume seeks to provide insight into how Christians can prepare themselves for eternity, its partner volume, Holy Living, offers readers advice concerning how to live a virtuous Christian life. The first half of Holy Dying delivers practical suggestions for cleansing and building up the soul in godly fashion. The latter half includes a memorial sermon both for a friend of his and for Christians who have died generally. Taylor's work has received praise not just for its devotional merit, but also for the delicate musicality of its prose. Both John Wesley and Samuel Taylor Coleridge held Taylor's achievements in equally high regard. Today, Taylor's practical wisdom still reads like prose poetry. This book is the first volume in a two-volume devotional set. While this volume offers readers advice concerning how to live a virtuous Christian life, its partner volume, Holy Dying, seeks to provide insight into how Christians can prepare themselves for eternity. Holy Living is highly practical; along with discussions of theology and moral instruction, it contains modeled prayers geared towards implementing faith in practice. Taylor's work has received praise not just for its devotional merit, but also for its literary prowess. Both John Wesley and Samuel Taylor Coleridge held Taylor's achievements in equally high regard. Today, Taylor's practical wisdom still reads like prose poetry.